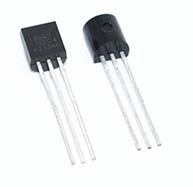 One Wire temperature sensor DS18B20 is very popular and easily available because they are quite cheap and provide satisfactory precision of temperature readings. One wire DS18b20 has operating temperature range from -55°C to +125°C with accurate to ±0.5°C. DS18B20 can easily interface with Raspberry Pi. This sensor has three pins: VCC, GND and DATA. The voltage range is between 3.0 to 5.5 so this can be easily interfaced with raspberry pi. To communicate with the sensor 1-wire protocol is used. As each DS18B20 sensor has a unique serial code. Therefore we can connect number of them on same line. Lets connect one wire temperature sensor to Raspberry pi. Don’t forget to add 4.7k resister between 5v and data pin. Our Raspberry Pi acts like a master on a bus to get readings from sensors. The 1-wire communication on GPIO4 is already implemented as kernel module in Raspbian, lets make some config changes to get some temperature readings. Issue following two commands from shell. Add follwing line at the end of file and Ctrl+O to save changes then Ctrl+X to close nano editor. After rebooting RPi ssh to RPi again, type the following two commands you see below. modprobe w1-gpio registers the new sensor connected to GPIO4 so that now the Raspberry Pi knows that there is a 1-Wire device connected to the GPIO. modprobe w1-therm tells the Raspberry Pi to add the ability to measure temperature on the 1-Wire system. # This file contains the names of kernel modules that should be loaded # at boot time, one per line. Lines beginning with "#" are ignored. # Parameters can be specified after the module name. In the first line we can see if the reading was successful (“YES”) and in the second line after “t=” is the temperature reading in mile degrees Celsius (21750). This is a great project I would like to try it out. Just one note, the Raspberry Pi GPIO pins are only rated for voltages between 0V and 3.3V. If you connect the VCC pin on the DS18B20 and the 4.7k resistor to the Pi 5V pin immediate damage will occur and will render the input permanently non-functional as there is no over-voltage protection. i know but i m using 5v for DS18B20 sensors, i had lots of trouble reading reliable temperature reading while using 3.3v. perhaps i have about 10m long cable connected to DS18B20 and voltage get dropped? never had time to check this. but thank you for sharing link. do you have any script or any way of saving this info in database? something that read multiple temperature sensors and save reading along with temperature sensors id to database. yes i do have one python script for this very purpose, i need to change few bits before i can share it with you. sorry dont understand what you are asking here, if you want to know about directly connected sensors with Raspberry Pi, you need to run gpio_ds18b20.py and enable it in cronjob as well. I’m sorry that my question is incomprehensible. what should I do to use the sensor for boiler control? did you download this python file from Github? and it contains this file. I downloaded and changed the file. The problem is that I don’t understand that. I managed to solve it. I found the solution in a previous post. It only works with pyton 2. Get an API key, copy that into your pihome.system table together with your city and country. The 5-day forecast is free, I think to make the 6-day forecast work you would need to pay? @artlab, 6 days works for me and i m using free api key. @artlab, that looks very good, some amount of code went into that. i know openweather api is bit flaky but its free. Thanks for the help, I managed to do it. How can I set PiHome Temperature Graps to see the values of the heat sensors? Only the outside temperature is now on the graph. Based on your instructions, you have been able to set the graps. “Node id” had to change. I would have another question for you. How can I rename things? What are the files I need to overwrite?